Whether your business is booming or you’re experiencing a lull in consumer spending, it is important to defend your position in the market and remain competitive. Here are two key customer service trends that can help your company gain an edge over the other guys. Perhaps the easiest, yet most overlooked, way to be competitive is to simply treat your employees well. Employees are the face of any company and often the first interaction with customers. Happy, appreciated employees are more likely to feel invested in the company, thus willing to go the extra mile. Providing great benefits and other perks (say, free gym memberships, extra vacation days for a job well done or even free office snacks and bottled water), a positive working environment and regularly showing appreciation can go a long way in your employees’ customer service efforts. Savvy companies and business owners know that their call centers are their first line of defense in customer service and gaining customer trust and loyalty. In fact, three-quarters of companies out there say customer service is a customer differentiator. In light of this, many smart companies are migrating to the cloud to provide excellent customer service. Why? Businesses recognize the advantages of shifting contact centers to the cloud as a means of competitive advantage, as well as to see financial savings and an increase in customer satisfaction. Just what is the cloud? The cloud is a network of servers, each of which serve a unique purpose. Some servers use the cloud to run an application or provide a service. 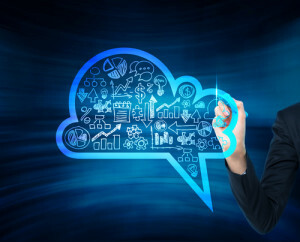 Why should companies use technology like the cloud for customer service? Cloud-based call centers allow companies to offer on-demand support to their customers, anywhere and anytime. Companies that shift to the cloud are more agile and better positioned to react to customer issues quicker, in turn, gaining a competitive edge. Further, companies who move call centers to the cloud also cut down on sales representatives and on-site technology. Working with cloud software companies can streamline processes and also reduce your company’s vulnerability to cyber attacks. A cloud-hosted contact center is fast and easy to set up with no equipment required — only a computer and a Wi-Fi connection. Most cloud-based contact centers also don’t require any money up front, but rather are based on a fee that you pay as you go. As a result, companies cut down on IT costs they’d otherwise have to pay for. Cloud-based call center software also allows staff members to work from anywhere just as efficiently as if they were in an onsite office, easily making, receiving and transferring calls, as well as directing calls to the right company department. Truth be told, anything companies can integrate to provide excellent customer service should be considered. But those that allow you the operational advantage of leveraging cutting-edge solutions without monumental costs are often the best to implement first. Sheryl Coonan is a seasoned journalist, writer, proofreader, content creator and PR professional. She has had experience in print, digital and broadcast media in a variety of industries, including entertainment, human resources, beauty, fashion, health, lifestyle, social media marketing, tech and more.